At long last, Multiplex 10: the animated short is finally available for rent or purchase the animated short on Vimeo On Demand! AND the first web series episode is now on YouTube (and Vimeo and Facebook). AND the animated short has been officially selected by the Mindfield Film Festival! AND I chatted with the No Coast Cinema podcast about the animated short, the dearly missed comic strip, and more! 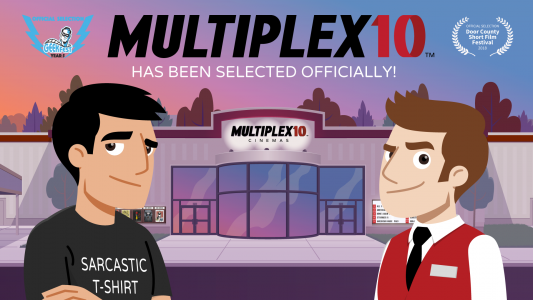 Multiplex 10 is coming in ONE WEEK! In one week, not only will the Multiplex 10 animated short finally be released to THE ENTIRE WORLD on Vimeo On Demand! It will be $1.99 to rent or $4.99 to buy in the US — and I forget how much in other countries. Yep. Looks like Jason and Kurt are talking about movies! 😀 SHOCKING. Next week’s gonna be awesome, you guys. Awesome. Multiplex 10 has been selected by the Door County Short Film Festival and GeekFest! Multiplex 10 has been selected—officially—by the Door County Short Film Festival in Sister Bay, Wisconsin, and GeekFest, a touring festival with stops at comic book conventions across North America, including Long Beach Comic Expo, MegaCon, Dallas Comic Con, Comic Con Palm Springs, Fan Expo Canada, Long Beach Comic Con, Rose City Comic Con, Stan Lee’s Los Angeles Comic Con, HawaiiCon, New York Comic Con, and Rhode Island Comic Con. Hopefully these are just the first of many, but we’re thrilled and honored to be included in both festivals! Multiplex 10: the animated short is now available for PRE-ORDER! 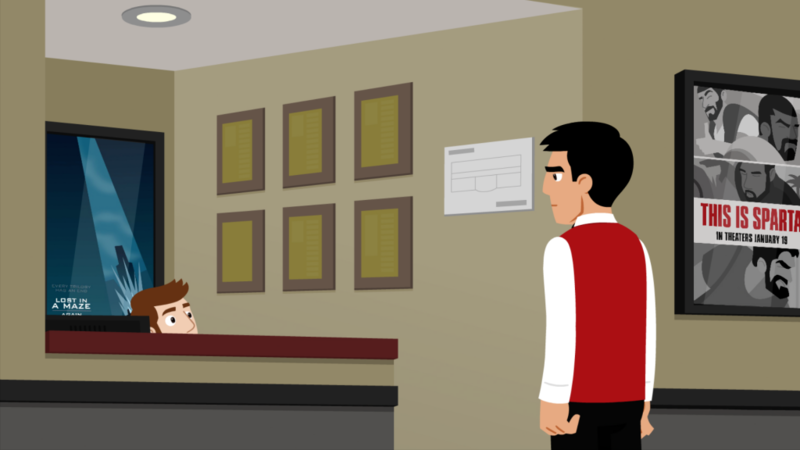 MULTIPLEX 10 is an animated comedy short that centers around the lives of the movie-loving and customer-weary staff of the Multiplex 10 Cinemas. Kurt is an usher, pining for that special someone to share his love of horror movies. The newest hire, Jason, is a film snob who just needs a freakin’ job, okay? Despite their differences, the pair will make fast friends — unless they kill each other first. A Chase Sequence and Strangewaze film, MULTIPLEX 10 is coming to Vimeo On Demand at MIDNIGHT Eastern on January 29, 2018. You can pre-order it through Vimeo On Demand NOW. Directed, executive produced, and animated by Gordon McAlpin, MULTIPLEX 10 was co-written by McAlpin and Dana Luery Shaw (Echo Chamber, Classic Alice), based on the comic strip Multiplex created by Gordon McAlpin. The cast includes Gordon McAlpin, Tom Brazelton, Dana Luery Shaw, Aiyanna Wade (Nostalgia Critic), Javier Prusky (Halt and Catch Fire), Joe Dunn, and Chris Rager (Dragonball Z, Borderlands 2). Tangelene Bolton (American Zealot, Jem and the Holograms) composed an original score.